Have you been watching The Good Wife this season? It definitely falls into the “OMG-TV” category. Julianna Margulies has been killing it even more than usual as Alicia Florrick on the show. The home she shares with husband Keith Lieberthal and their son Kieran in Manhattan is featured in the new Architectural Digest, so let’s take a look! 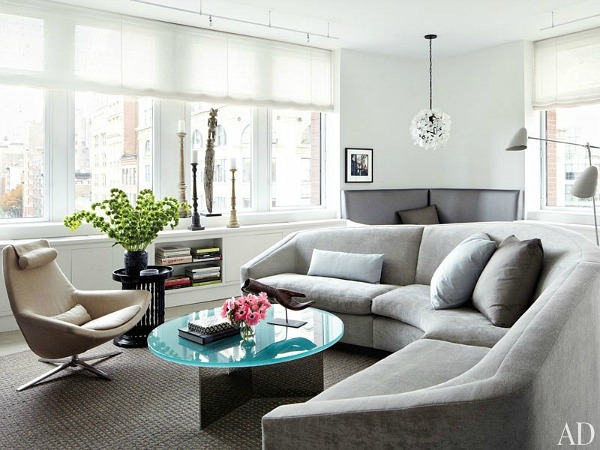 The 2,200 square-foot Manhattan apartment was designed by Vicente Wolf with modern and Asian influences. She says she bought it to flip it years ago but then liked it too much to let it go. I was surprised by how spare and masculine it looks. I expected her to be a more traditional girl, I guess. Or maybe it’s because I’m used to seeing her in Alicia’s apartment on Good Wife! Shortly after these photos were taken, the apartment was completely flooded when an upstairs neighbor’s radiator “exploded,” as Julianna described it. Yikes. Sounds like it was a huge mess. Gorgeous place, for a classy lady. This is the perfect NYC apartment; modern, glamorous and tasteful. Love her apartment on the show too, but it sounds like her real life character is very different than Alicia Florrick, so it makes sense that her taste in décor would differ as well. It’s beautiful, of course — but over-decorated + staged for my tastes. You can’t tell who lives there. Meow. Sorry. Nope. I just can’t get into modern decor. Leaves me cold, although at least this isn’t all chrome and glass. I like Julianna Margulies, though! Exactly my thoughts – I just can’t do modern. But love the actress and the show! It’s a lovely apartment for someone who leans more towards a modern contemporary feel but my vote would go for the apartment showcased on the TV show. It just feels more welcoming & somewhere I could linger & feel right at home. I don’t get that feeling from this home however. The Asian influences make the apartment special and smooth feeling. 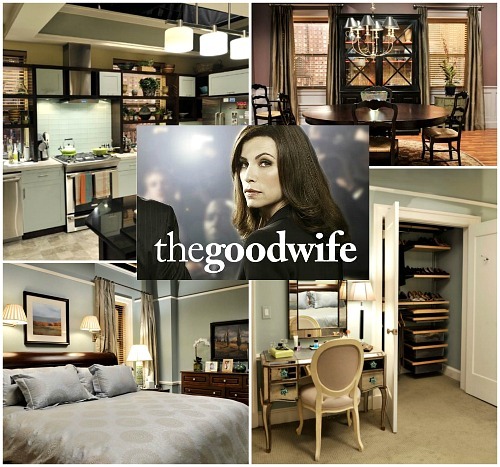 I actually prefer it more than Florrick’ house. It’s a shame that the flat was harmed by the radiator explotion. Sending you a BIG HUG, Julia! Have a Blessed Day, my friend! are the references to TGW/Alicia Florrick your’s or AD’s? Because Alicia is a character and Julianna is a real person. Anyways, the apt doesnt look as stale as most AD spreads. The living room looks comfy. I dont like the high backless kitchen stools. Both. And I do realize she is not her character. Just saying that I pictured her in more traditional surroundings, perhaps because I’m used to seeing her in Alicia’s apartment. ps; i’m sure she has a white kitchen bc she doesnt have to clean it ! For some reason I don’t even find the decor soothing . . .and the kitchen is so blindingly white you’d need sunglasses:) I was so hoping that ‘Alicia’ and her kids would be moving back to their traditional home on the show . . . . I loved that house! But . . .I think her mother-in-law still owns it . . . I was hoping the same thing, Karen. I loved that house, too! Not my tastes, but I feel for her loss. We had a massive landslide here on Sunday. It mostly missed the house but it took out my beloved studio, all the fences, and the whole hillside. One minute it’s there, the next it’s gone! Oh, no! I’m so sorry to hear that, Wendy! I don’t care for this very much. Contemporary has always been my least favorite style and this looks cold and dull. It has a sleek coldness to it somehow. I would never have guessed that. I do love the light fixture in her room though. A cool space, although a bit modern for me! have you seen Kyle Richards’ house on Real Housewives of Beverly Hills? I LOVE her style! love the views from the livingroom. i wouldn’t have let it go either.